Eleg;^fcaste " By George Smith, Upholder Extraordinary to thevince of Wales. (!) Published 1808. This is dedicated to u His Royal Highness the Prince of Wales, . . . who has so liberally employed his elegant fancy and acknowledged good taste in promoting this noble pursuit after Classic originals; and the elegant display of superior virtA exhibited in his palaces in Pall Mall and at Brighton." "The Upholsterers' and Cabinet-Makers' Pocket Assistant." By John Taylor. About 1810-1820.
" Original and Novel Designs for Decorative House-hold Furniture." By J. Taylor. About 1810-1820 or 1830. "The Cabinet Maker and Upholsterer's Guide. By George Smith, Upholsterer and Furniture Draughtsman to His Majesty; Principal of the Drawing Academy, Brewer Street, Golden Square; and author of various works on the Arts of Design and Decoration." Published 1826. 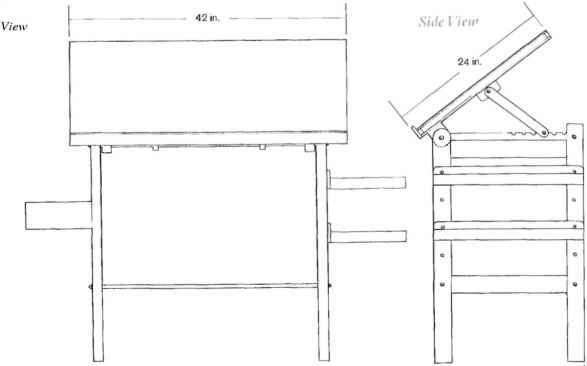 "A Useful and Modern Work on Cheval and Pole' Screens, Ottomans, Chairs, and Settees, for mounting Berlin Needlework,"—the italics are my own—"by Henry Wood, Decorative Artist and Draughtsman." (Undated.) The mere recollection of them all is sufficient to induce a shudder.